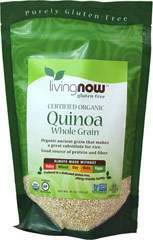 Organic ancient grain that make a great substituted for rice. It has a mild, delicate flavor that's slightly nutty, making it a popular addition to many vegetarian recipes. Sprinkle some on your favorite salad for an extra burst of flavor and nutrition! With Puritan's Pride® Coconut Oil Shampoo your hair will smell and feel like a tropical paradise. Carefully formulated with nourishing ingredients , our Coconut Oil Shampoo will leave your hair healthy, radiant and vibrant. No Parabens, No Petroleum, No Phthalates, No Artificial Color and No Animal Testing. This product supports intestinal health to help provide a favorable environment for the absorption of nutrients, and is guaranteed to provide three billion live cells per capsule at the time of manufacture. 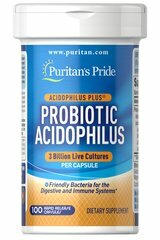 ** It includes Acidophilus and nutritionally supports your digestive tract, encourages intestinal microflora balance, and promotes the healthy functioning of the intestinal system. ** One serving delivers a proprietary blend of cultures and 100 mg of Citrus Pectin. Adults can take one to three capsules daily preferably with a meal.